We want to get you acquainted with NEHS to help you get your chapter up and running quickly and smoothly. 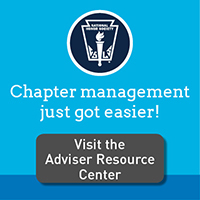 Browse these links to become familiar with essential chapter management matters. Take time to print out and review the official governing document for all NEHS chapters. This online version of the Constitution is the most up-to-date edition for you and your chapter to use. Share a copy with your principal. All chapters are required to have bylaws. A sample set of bylaws is available once you log in to the Adviser Resource Center. Learn about how your students become members, including information on methods of selection, membership obligations, and other helpful information to assist new members in understanding what being a member of NEHS is all about. Designed just for chapter advisers, this is the members-only section of our site. Information to assist with chapter management, important dates for your NEHS chapter calendar, and news relevant to your student recognition program. In addition, your link to the archives of all of our newsletters and promotions will be located in this section. Now you can get many of the educational resources you need in one convenient online location with special member discounts. Go to the NEHS Store to purchase insignia and clothing supplies for you or your chapter members, as well as publications and audio-visual resources on a wide range of topics. Whatever your question may be, there is someone at the Honor Society’s national office with an answer. Contact us right away by email at nehs@nehs.org if we can help you with a question or direct you further to the resources.